지난 3월 24일 사우스 카운티 하이스쿨에서 버지니아 주의 민주당 주관으로 여성의 달을 맞아 여성의 사회적 역활과 진출에 대한 토론회가 열렸다. 모든 참석자들은 하나같이 여성은 남성과 동등하게 사회에서 대우 받아야 하며, 그 첫번째의 시작은 급여가 하나의 예가 될 수 있다고 말하며 똑같은 일을 하고 남성에 비해 여성이 더 적게 받는 경우는 사라져야 한다고 말했다. 최저 임금의 상승이 절실하게 요구되며, 메디케이드의 확장으로 인해 몸이 아파도 병원에 갈 수 없는 가난한 사람들에게 길을 열어 주어야 하지 않겠냐고 말했다. 그러면서 이러한 것들은 모두 다 가장 평범하게 삶을 이어나가는데 절대적으로 필요한 것이며, 또한 이러한 요구를 당당하게 주장할 수 있는 사회적인 여성의 위치의 신장과 함께 정부에도 더 많은 여성들이 진출하여 여성의 문제를 바로 보고 해결해 나갈 수 있게 해야 한다고 입을 모았다. 지금까지 걸어온 길에 참석자들의 삶에 막대한 영향을 미쳤던 그들의 어머니, 어머니의 어머니가 있었다. 여성의 권리 신장을 위한 길에 이미 그들의 어머니의 선구자적인 행보가 있었음을 알 수 있었다. Donna Miller Rostant (Trial lawyer, partner and co-founder of Jones & Rostant, P.C. Fairfax VA; Chair of FCDC Election Law and Voter Protection, a former nursing school professor, clinical education and quality assurance coordinator at various institutions including Villa Maria College, the University of Southern Miami/Jackson Women’s Hospital. A lot to mention of her careers as a nurse, and as a trial lawyer, she have worked for women’s equality in work place and society where we are. Various discussion about the women’s social status and how to take care of issues related with women’s needs. Such as, child care system to be regulated by the law and staffs of the childcare personnel to be licenced and educated in ethical based. 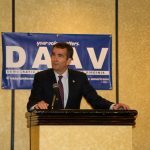 Virginia stated that women should be recognized by the law that women get equal pay, scholarship, childcare, reproductive rights. She said, women need step up for these rights to get for us and working together with men as companies rather than competetors in the work places. Kristine urged strongly about raised minimum wage, healthcare system to be equalized no matter what the gender is , family care, everything about women that it should be balanced out for competing other political parties. Jennifer agreed about the raised minimum wage and maidcaid expansion to be worked in VA for women who can’t afford to pay for their health care coverage as well. This entry was posted in General and tagged 여성의 달 맞아 토론회 개최 by Corih Kim. Bookmark the permalink.